As we noted shortly after the Crown Prince’s purge of potential rivals within Saudi Arabia’s sprawling ruling family, while the dozens of arrests were made under the pretext of an "anti-corruption crackdown", Mohammed bin Salman’s ulterior motive was something else entirely: Replenishing the Kingdom’s depleted foreign reserves, which have been hammered for the past three years by low oil prices, with some estimating that the current purge could potentially bring in up to $800 billion in proceeds. Furthermore, the geopolitical turmoil unleashed by the unprecedented crackdown helped push oil prices higher, creating an ancillary benefit for both the kingdom’s rulers and the upcoming IPO of Aramco. And, in the latest confirmation that the crackdown was all about cash, the Financial Times reports today that the Saudi government has offered the new occupants of the Riyadh Ritz-Carlton a way out.... and it’s going to cost them: In some cases, as much as 70% of their net worth. Saudi authorities are negotiating settlements with princes and businessmen held over allegations of corruption, offering deals for the detainees to pay for their freedom, people briefed on the discussions say. In some cases the government is seeking to appropriate as much as 70 per cent of suspects’ wealth, two of the people said, in a bid to channel hundreds of billions of dollars into depleted state coffers. 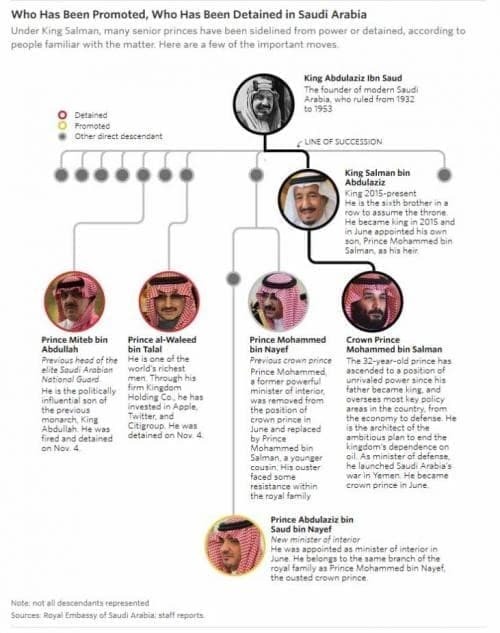 The arrangements, which have already seen some assets and funds handed over to the state, provide an insight into the strategy behind Crown Prince Mohammed bin Salman’s dramatic corruption purge. 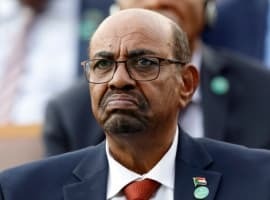 The crackdown has led to the detention of hundreds of royals, ministers, officals and the country’s richest oligarchs including Prince Alwaleed bin Talal, the billionaire, Waleed al-Ibrahim, the founder of Middle East Broadcasting Center, which owns Al Arabiya, the Saudi satellite television channel, and Bakr bin Laden, chairman of the Saudi Binladin construction group and brother of Osama bin Laden. 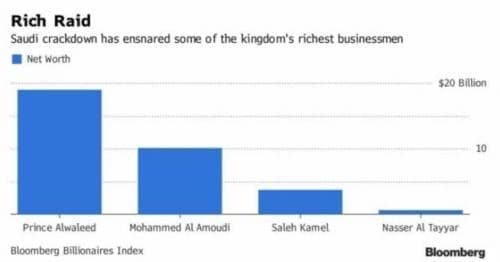 Additionally, as we reported, the crackdown sent members of the country’s wealthy upper crust scrambling to liquidate their holdings and move their cash offshore, where they might have a better chance of keeping it away from the Saudi government. Related: Is Saudi Arabia Lying about Its Oil Inventories? Unsurprisingly, the Saudi "offer" is working. Some of the suspects, most of whom have been rounded up at the Ritz-Carlton hotel in Riyadh since last week, are keen to secure their release by signing over cash and corporate assets, the FT's sources say. “They are making settlements with most of those in the Ritz,” said one adviser. “Cough up the cash and you will go home." 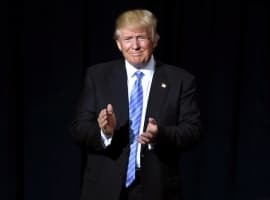 One multi-billionaire businessman held at the Ritz-Carlton has been told to hand over 70% of his wealth to the state as a punishment for decades of involvement in allegedly corrupt business transactions. He wants to pay, but has yet to work out the details of transferring those assets to the Saudi state. One detainee told his staff that the authorities may be looking to take ownership of his main business. Families of detained suspects have started to hire consultants to assist efforts to secure their relatives’ release and to ring fence the damage to their business interests. “They are looking for ways to isolate the tainted shareholder and keep the business going,” said the adviser. 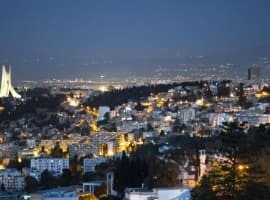 The settlements aim to recover billions of dollars allegedly earned through “corruption” at a time when the government is grappling with a recession triggered by prolonged low oil prices and a budget deficit that widened to $79 billion last year. The country’s attorney-general has said he is investigating allegations of corruption amounting to at least $100 billion - though the total value of assets seized could be as high as $800 billion. Though the Financial Times puts the high-end figure at a relatively modest $300 billion; to make up for the delta, more arrests are still expected. In Saudi Arabia, they are about to do just that. Mohammed bin Salman probably got the idea from watching the Obama administration shake down U. S. corporations. MSB had made a statement in the last couple of weeks about "destroying the extremists now" and "not waiting 30 years" to do it. I just wonder if the guys he's rounding up in the crackdown aren't the same guys who've been financing Islamic terrorism around the world as well. He might be killing two birds with one stone.